Either it’s season of summer or winter air conditioners are always in demand and people look for the best brand of AC for their home or offices. If you are one of those who want to replace their air conditioners (AC) or want to buy new air conditioner then must read this worthful post. 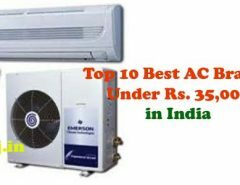 As I have came up with the list of top 10 best air conditioner brands in India with price. I don’t need to tell what exactly air conditioner is? As a school going kid can tell you that an air conditioner (AC) is modern equipment which is use to cooling / heating the room temperature by lowering the heat/cooling and adjusting the room temperature but the main question is what kind of AC we should buy or how can you measure how much ton of AC you need. How to Measure How Much Ton of AC you Need? Don’t get confused you can measure yourself that how much ton of air conditioner you need via using this simple formula. So it’s clear to get this figure first you need to calculate the room in the feet (Length x Width x Height) now compare it with below mentioned chart and find out how much ton fit for you. Go higher star rating of AC if possible because as higher as star rating is the more energy efficient AC is. If you are buying for your home and house is small then recommend for the Window AC. Before buying AC check its warranty / guaranty / service after sale offering by AC Company. Well almost everything is done now you know how much ton of AC you need and also got few point to check before buying AC now we move to our main step best brand of air conditioners in India. I start my list with the Indian electronic company which was founded in the year 1943 by an entrepreneur, namely “Blue Star”. Company has its own reputation in the market of Air Conditioner and its giving tough competition to international air conditioner brands. Company not bound in India only it spread all over the world and they have service delivery centers in US, UK, Singapore, Malaysia and India. It can understand that they are in the industry from numerous years and increasing day by day it has 7 branches in India with over 30 offices. The Air Conditioner of Blue Star are featured with cleanable panel, anti-freeze, on/off timer and AC’s are durable and stunning performance. Special Features: Auto Restart with Memory Backup, Anti-Corrosive Blue Fin Condenser , ON/OFF Timer, Sleep Mode, Auto Mode, Cleanable Panel, Dry Mode, Self Diagnosis, Powder-Coated Outer Body, Anti-Freeze Thermostat, High Efficiency Rotary Compressor and Hydrophilic Fins Evaporator. Another Indian company in the list of top 10 best air conditioner brands in India is Videocon. Every Indian is very familiar with the Videocon products as company deliver high quality of consumer electronics like TV, Washing Machine, Microwave, AC and more. When it’s comes to air conditioners of Videocon, consumer consider it as a reliable brand and company have managed to stand upon its reputation by providing excellent services. Special Features: Gold Fin Evaporator, Full IMD & Glossy Panel, Adjustable Louvers (6 Levels), Auto Clean, Vitamin C Filter etc. Hitachi ia a multinational engineering and electronic company with its headquarter in Tokyo, Japan. The company use most advanced technologies and produces the high quality of products. Hitachi air conditioners are featured with self cleaning system that’s really great. Hitachi defeated several companies in terms of innovations as it includes lower power consumption and the emission of less green house gases a DDS to the brilliant factor another star. Special Features: Nano Titanium WASABI Air Purifying Filter, Antibacterial, Anti-Allergen, Mold and Fungi Suppression, Odor Removal, UV Air Cleaner, Minus lon Stick, DC Power System, Antibacterial Tangent Fan, Energy Saving Indoor Unit and so on. The Chinese multinational company Haier is also in the list of top 10 best air conditioner brands in India. Haier also deals in other electronic equipment but well known in the market for its air conditioner. The Haier head office is located in Qingdao, People’s Republic of China. Air conditioner of Haier become popular because its affordability, reliability and off course for low energy consumption. Special Features: Energy save mode, sleep mode, auto air swing, auto restart, anti bacteria filter, vc filter, golden glasses, sleep mode etc. One of the most popular and biggest manufacturers of air conditioners in Middle East and India. The O’General get 5 stars by the Bureau of Energy Efficiency of India. All the customers who bought O’General air conditioners are happy and positive have positive reviews about the it’s air conditioners. Special Features: Moisture Removal, Air circulation (High), Air Direction Control, Input Power, Power Consumption etc. The South Korean giant holds its dominance all over the world in field of air conditioner. Adhere to Indian customers they offers a broad range of AC’s which cater to specific need. LG is well known brand in the electronic field but it gain its popularity in the AC because of its unique features, economic pricing and good consumer care facilities. Special Features: dual protection filter, On/Off timer, 4-way air deflection, E-Saver, sleep mode & night glow remove button and more. Does it require any introduction?? Obviously not as its very popular in common people because of high quality and features mobile as well as electronic products. Well the best thing about Samsung AC due to which it gaining huge popularity is that it can withstand high voltage of 135v-290v. Inspite of this Samsung air conditioners are featured with De-humidification, automatic cleaning, turbo cleaning and energy star rated etc. Warranty: 1 year warranty on all parts, thereafter 4 year additional warranty on the compressor from the date of purchase. Special Features: powerful UTR plus compressor cools even at 54 degree Celsius, de-humidification, automatic cleaning, turbo cleaning, virus doctor eliminates 99.99% of bacteria & virus. Whirlpool is another brand in the list of top 10 best air conditioners companies in India. Whirlpool head office is located in Benton Charter Township, Michigan, US. The air conditioner of whirlpool is featured with turbo cool technology which initially switches on the air conditioner automatically to work at its highest performance levels. Special Features: Dual Fan Compressor, Climate Control TEchnology, 3D cool technology for fast and uniform, 6th sense energy saver, turbo cool function, MPFI technology, 6th sense auto restart. One more Indian air conditioner company in the list is Voltas. The company founded in the September 6 1954 at Mumbai. Voltas is one of the leading and reliable air conditioner company in India as well as other parts of the world. If you are looking for durable and long lasting air conditioners then you may trust on Voltas air conditioners. Special Features: anti-dust filters, anti-fungal clean, swing, 3D airflow, auto restart, sleep mode, high EER rotary compressor, cross flow air vent etc. List could not be completed without mentioning the Daikin air conditioners as the company founded in the year 1924 as electronic company but it get huge success and popularity in air conditioners. The best thing about the Daikin air conditioner is its affordable price and high quality of features which help to gain popularity in Indian market. Special Features: auto fan speed feature, higher COP, consume less energy, smoothly curved wide angle louvers, vertical auto-swing function, wireless remote controller, 24-hour on/off timer. u hv included O general. it makes lot of noices. we hv Onida the best one. Blue star committed to delivering the highest quality and it’s rated as best AC brand. Blue star offers best services at very reasonable prices which can be from 20,000- 1,00,000. Daikin should b on top of all brands.worlds no.1 air conditioning. I am interested in doing the business if electronic company if there is any goods business oppurtunity for state of karnataka in that the part that is NORTH KARNATAKA . As already am into distribution & CFA concept in FMCG Segments. Kindly let me know if there is any goods business plan. It will be very much glad to have a positive reply from your end. Any More details required about us Please revert on my mail id which is already mentioned in details. I think Daiken is the No,1 brand in A.C.segment, no one can beat this co. I want purchase 1.5 T Split Ac with 5 star rating. They are giving 5 year warantee of Machine,Compressor & Gas refilling. or go for Duakin or mitsubisi? Prise is also importatnt factor. Good job done. Advise you to please include Mitsubishi Electric name too which is doing spectacular business in India and has emerged most premium products in AC market. sure Sanjeev Ji I will do the needful and updated it in this season article. I will recommed you to go with Videocon as it’s Indian (Swadeshi) AC as well and have good feature and quality. what is your opinion about Haundai……is it fall in top 5 category in the list of durability and long lasting? This is a nice post about air condition. Air condition gives great comfort during summer days by providing cool air. So thanks for writing such a beautiful post.